Background: In addition to nonmodifiable genetic risk factors, potentially modifiable factors such as hypertension, hyperlipidemia and environmental exposures have been identified as risk factors for Alzheimer disease. In this article, we provide physicians with practical guidance on risk assessment and primary prevention of Alzheimer disease based on recommendations from the Third Canadian Consensus Conference on the Diagnosis and Treatment of Dementia, held in March 2006. Methods: We developed evidence-based guidelines using systematic literature searches, with specific criteria for study selection and quality assessment, and a clear and transparent decision-making process. We selected studies published from January 1996 to December 2005 that met the following criteria: dementia (all-cause, Alzheimer disease or vascular dementia) as the outcome; longitudinal cohort study; study population broadly reflective of Canadian demographics; and genetic risk factors and general risk factors (e.g., hypertension, education, occupation and chemical exposure) identified. We graded the strength of evidence using the criteria of the Canadian Task Force on Preventive Health Care. Results: Of 3424 articles on potentially modifiable risk factors for dementia, 1719 met our inclusion criteria; 60 were deemed to be of good or fair quality. Of 1721 articles on genetic risk factors, 62 that met our inclusion criteria were deemed to be of good or fair quality. On the basis of evidence from these articles, we made recommendations for the risk assessment and primary prevention of Alzheimer disease. For the primary prevention of Alzheimer's disease, there is good evidence for controlling vascular risk factors, especially hypertension (grade A), and weak or insufficient evidence for manipulation of lifestyle factors and prescribing of medications (grade C). There is good evidence to avoid estrogens and high-dose (> 400 IU/d) of vitamin E for this purpose (grade E). 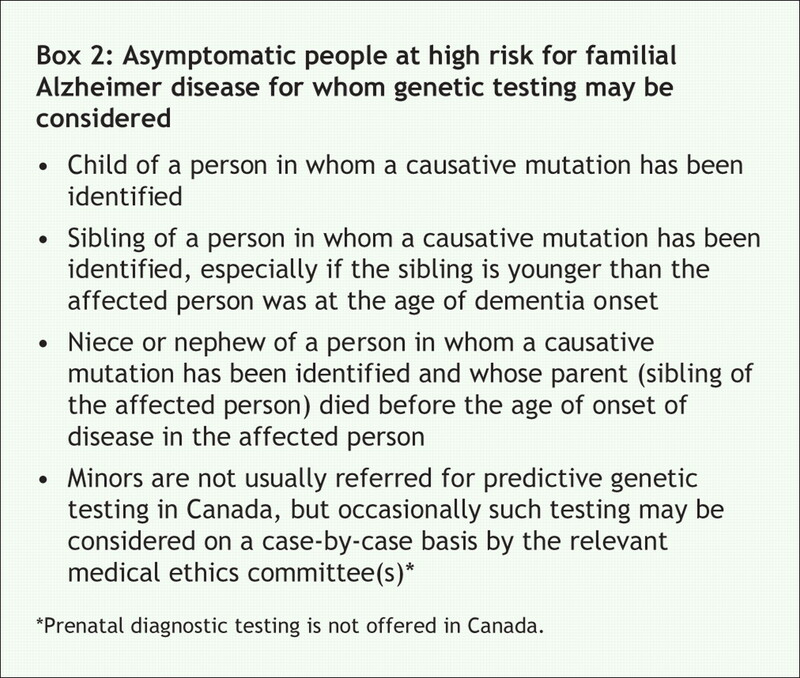 Genetic counselling and testing may be offered to at-risk individuals with an apparent autosomal dominant inheritance (grade B). Screening for the apolipoprotein E genotype in asymptomatic individuals in the general population is not recommended (grade E). Interpretation: Despite the personal and societal burden of dementia, our understanding of genetic predisposition to dementias and the contribution of other risk factors remains limited. More importantly, there are few data to explain the overall risks and benefits of prevention strategies or their impact of risk modification. Mr. A, a 45-year-old professional, presents for a routine health check-up, during which he states “I am quite worried about getting Alzheimer disease, just like my mother.” He goes on to say “As you know, our family has been caring for her while she slowly deteriorated. A month ago, we had to move her to a long-term care facility. It is really taking a toll on our family. So I want to know what my chances are of escaping this terrible disease. I want to do everything I can to avoid my mother's fate.” Mr. A then goes on to say that his mother, who is alive, had her first symptoms of dementia at the age of 74 years. To his knowledge, no other family members, including aunts and uncles, have been affected by dementia. Mr. A is relatively healthy. He has never smoked and rarely drinks alcohol. However, he has been taking medication for hypertension for over a year and has hyperlipidemia. On this visit, his blood pressure is 145/90 mm Hg. His total cholesterol level is 5.7 mmol/L, high-density lipoprotein (HDL) cholesterol level 1.39 mmol/L, low-density lipoprotein cholesterol level 4.31 mmol/L, triglyceride level 2.34 mmol/L and total cholesterol:HDL ratio 4.1. What should you advise Mr. A about his risk of dementia? More importantly, what should you tell him about preventing or decreasing his chances of getting dementia? This hypothetical patient's story and concerns are all too familiar. Dementia is a devastating illness for patients. For families, the emotional, physical and financial burden of this illness is also substantial. Because 1 in 12 Canadians over the age of 65 years may be affected by dementia,1 there are also important consequences for society as a whole. Why does dementia occur in some people and not others? How can patients minimize their chances of facing a future with dementia? In recent years, a number of longitudinal studies have better defined risk factors for various types of dementia.2 Lifestyle factors such as tobacco use, diet and alcohol as well as vascular risk factors have emerged as important predictors. Several genetic factors have also been identified.3 In this article, we provide physicians with practical guidance on risk assessment and primary prevention of Alzheimer disease supported by evidence-based recommendations from the Third Canadian Consensus Conference on the Diagnosis and Treatment of Dementia (Box 1). A description of the process used to generate these recommendations is provided in the first article of this series1 and in an online appendix accompanying this article (available at www.cmaj.ca/cgi/content/full/178/5/548/DC2). Like Mr. A, many patients ask about their baseline risk of dementia. Family physicians should appreciate that they are attempting to predict the onset of a heterogeneous group of diseases. As a consequence, it is possible that some risk factors may predispose to some types of dementia while having little influence on predicting the onset of other types. In this article we focus on Alzheimer disease, first considering genetic aspects, then vascular, lifestyle and finally sociodemographic risk factors (Table 1). To assess genetic risk in an individual or family, it is critical to obtain an accurate family history with as much information as possible about the diagnosis of dementia and age of onset in reportedly affected family members. Obtaining reliable answers to these questions is not a trivial task. If it is not possible to examine the affected family members, confirmation of diagnosis by review of clinical reports and neuropathologic findings, if available, adds to diagnostic certainty. In addition to confirming the diagnosis in relatives, attempting to establish the age of onset is also important. Often the medical history of a person's parents is unknown because of distance, life circumstance such as divorce, reticence of the previous generation to discuss personal issues, or death from other causes at a young age. Furthermore, the person may have no siblings, or have no information on siblings' health status. Incomplete family histories can be a major hurdle in assessing genetic risk. Early-onset Alzheimer disease, which may have a significant genetic component, is generally defined as occurring before 60 years of age. It accounts for only 6%–7% of all cases of Alzheimer disease.19,20 From this small pool of patients, only 13% clearly exhibit autosomal dominant transmission over more than one generation, which means that a sibling, a parent and a grandparent also has Alzheimer disease.20,21 To date, all 3 known causative gene mutations (changes that almost always result in Alzheimer disease if the patient lives long enough) lead to the early-onset form.3 The first of these genes to be identified was the amyloid precursor protein gene, located on chromosome 21. Mutations in this gene cause excessive cleavage by the β- and γ-secretase enzymes, instead of normal cleavage by the α-secretase enzyme. 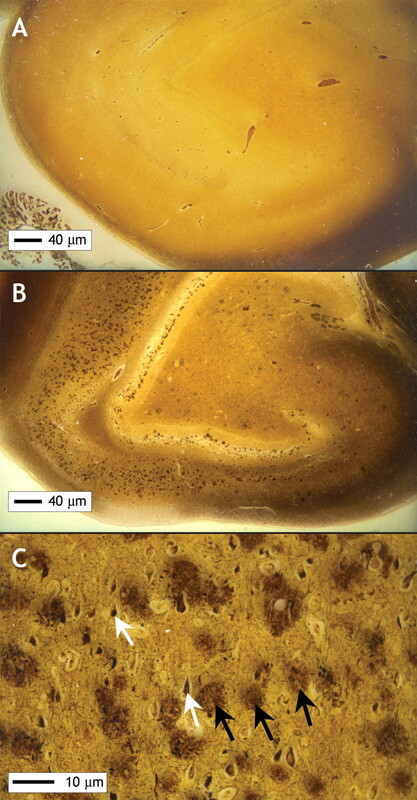 The result is increased production of toxic β-amyloid fragments, which are converted into insoluble aggregates that form senile plaques in brain tissue (Figure 1 and Figure 2). Two other genes that cause familial early-onset Alzheimer's disease are presenilin-1, located on chromosome 14, and presenilin-2, located on chromosome 1. Both of these genes are involved in the γ-secretase complex, and mutations lead to excessive cleavage by the γ-secretase enzyme, which results in increased production and accumulation of β-amyloid fragments (Figure 1). These mechanisms are not known to be associated with late-onset or sporadic Alzheimer disease. Among families in which causal genetic mutations for early-onset Alzheimer disease have been identified, 30%– 70% of mutations are in the presenilin-1 gene, 10%–15% are in the amyloid precursor protein gene, and less than 5% are in the presenilin-2 gene.23 Many cases of early-onset Alzheimer disease do not have an identified genetic mutation, possibly because the specific genes have not yet been identified or because some cases may have different causes. To date, no single causal genetic mutation has been identified for late-onset Alzheimer disease. Most cases are believed to be complex and likely influenced by a mixture of genetic risk factors (e.g., the apolipoprotein E gene [APOE] and the sortilin-related receptor 1 gene [SORL1]) and by acquired risk factors such as hypertension and diabetes, and probably many other factors yet to be defined. The risk to a person who has a first-degree relative (parent or sibling) with late-onset Alzheimer disease is slightly higher than the risk in the general population but much lower than the risk to someone with a familial pedigree of early-onset disease (see “Risk estimation” on page 554). The strength of the association between the APOE ε4 allele and Alzheimer disease is stronger among women than among men. It also diminishes with age, being stronger among people between 55 and 65 years old and less so among older people. This is likely because the risk of Alzheimer disease rises sharply in older age, whether or not the ε4 allele is present. Given the uncertainties surrounding potential increased risk for Alzheimer disease in an individual rather than in a population, screening for the APOE genotype is not recommended for clinically asymptomatic people as part of routine clinical practice. Recently, the sortilin-related receptor gene (SORL1) has been associated with late-onset Alzheimer's disease in several populations of different ethnic backgrounds in the United States.25,26 SORL1 is involved in amyloid precursor protein processing, which adds further support to the role of the amyloid cascade in the pathogenesis of Alzheimer disease. The utility of SORL1 in clinical risk assessment has yet to be determined, and testing for this gene is not yet available. A strong family history of dementia should trigger further investigation and referral to a specialist for consultation (Box 2). All patients suspected of having familial early-onset Alzheimer disease should be referred to a specialty memory clinic or genetic clinic for further evaluation (a list of Canadian centres offering clinical genetic services is available at http://ccmg.medical.org/clinical.html). Before any testing is performed, genetic counselling is considered essential. The discovery of an inherited causative gene for Alzheimer disease is likely to be extremely distressing. Thus, genetic testing should not take place unless all of the potential risks and benefits have been clearly explained and considered. To help determine whether there is a causative gene in Mr. A's family, we must consider 2 important questions. First, at what age did Mr. A's mother first experience symptoms of Alzheimer disease? Second, do any of his other family members have dementia and, if so, at what age was the onset and how are they related to Mr. A? In this instance, Mr. A appears to be a reliable informant about his mother's health history. There is nothing in Mr. A's reported family history to suggest autosomal dominant multi-generational transmission. Therefore, Mr. A needs no further work-up or assessment for the genetic aspect of his risk assessment. Considerable evidence from longitudinal cohort studies has indicated that the relation between blood pressure and subsequent development of dementia is somewhat complex.2 Although a number of studies have shown that elevated systolic blood pressure is associated with an increased risk of both Alzheimer disease and all-cause dementia, curiously some studies have shown that a systolic blood pressure below 140 mm Hg is also associated with an increased risk.4 Notwithstanding these and other apparently contradictory findings, the results of the Systolic Hypertension in Europe (SYST-EUR) study revealed a reduced risk of dementia among participants receiving antihypertensive treatment.34 In this trial, more than 3000 patients over 60 years old who had systolic blood pressures of 160– 219 mm Hg and diastolic pressures below 95 mm Hg, measured while seated, were randomly assigned to receive either nitrendipine (10–40 mg/d), with added enalapril or hydrochlorothiazide, titrated to reduce the blood pressure by at least 20 mm Hg to reach a value below 150 mm Hg, or matching placebo.34 The participants were free of dementia at baseline and were subsequently monitored by means of the Mini-Mental State Examination35 and further diagnostic tests to reach a definitive diagnosis of dementia (according to the criteria of the Diagnostic and Statistical Manual of Mental Disorders, third edition, revised [DSM-III-R]) if the score fell below 23. After a median follow-up of 2 years, the incidence of dementia was reduced by 50%, from 7.7 to 3.8 cases per 1000 patient-years in the treatment group, an absolute risk reduction of 0.39%. The relative risk of dementia was 0.47 (95% confidence interval [CI] 0.28–0.78), and most cases were diagnosed as probable Alzheimer disease. In absolute terms, the number of cases of hypertension needed to treat for 5 years to prevent 1 case of dementia is about 53. No other randomized controlled trial has shown such convincing results, and a meta-analysis of 4 trials concluded that the relative risk for dementia after treatment of hypertension was 0.80 (95% CI 0.63–1.02), just missing statistical significance.36 In the case of Mr. A, depending on the severity of his hypertension, appropriate treatment will reduce his risk of stroke, heart failure and myocardial infarction. Although there is no definitive evidence in his age group, his risk of dementia may also be reduced. Epidemiologic studies have established an association between hyperlipidemia and subsequent development of dementia. Longitudinal studies have established that midlife elevation of the total serum cholesterol level is associated with an increased risk of subsequent Alzheimer disease (relative risk 2.1–3.1).2 However, 2 large randomized controlled trials failed to show that use of 3-hydroxy-3-methylglutaryl– coenzyme A (HMG–CoA) reductase inhibitors (statins) reduced the incidence of dementia. One trial compared pravastatin (40 mg/d) with placebo in nearly 6000 men and women aged 70–80 years who had a baseline total cholesterol level of 4.0–9.0 mmol/L; the mean duration of follow-up was 3.2 years.37 By the end of the trial, there were no significant differences in the Mini-Mental State Examination scores between the pravastatin and placebo groups (mean difference 0.06 [out of 30], 95% CI 0.04–0.16; p = 0.59). Neither was there any difference in scores on instrumental activities of daily living, a sensitive marker for dementia. The other study compared simvastatin (40 mg/d) with placebo in over 20 000 men and women aged 40–80 years who had a baseline total cholesterol level greater than 3.5 mmol/L and who were followed for 5 years.38 By the end of the trial, the incidence of dementia was 0.3% in each of the 2 groups. For Mr. A, and indeed for all healthy middle-aged and elderly patients worried about memory loss, a pressing issue is whether there are lifestyle factors that could (or should) be modified in an attempt to preserve memory function with aging. Although a “healthy lifestyle” in general can be recommended to all patients, the question is whether there is an evidence base to support specific recommendations to Mr. A in order to preserve his memory. Early case–control studies had suggested that tobacco smoking actually reduced the risk of dementia, but longitudinal cohort studies have identified a significantly increased risk of all-cause dementia and Alzheimer disease among tobacco smokers.12 A pooled analysis of results from 4 European population-based studies involving over 28 000 people concluded that current smokers, but not former smokers, were at increased risk for Alzheimer disease.11 Although there is no conclusive evidence that smoking cessation will lessen his risk of Alzheimer disease, the mere possibility provides yet another reason to discourage Mr. A from smoking. Both total dietary fat intake and reduced levels of omega 3 fatty acids have been linked to an increased risk of dementia in epidemiologic studies.40 A recent longitudinal study has also suggested that adherence to a Mediterranean-style diet is associated with a decreased risk of Alzheimer disease,41 as is consumption of fish.2 In the absence of evidence from randomized controlled trials, we cannot offer unequivocal advice regarding diet for the primary prevention of dementia. However, in Mr. A's case, the presence of hyperlipidemia mandates that counselling to reduce intake of both saturated and total dietary fat should constitute part of his overall management regardless of any potential impact on his risk of dementia. Increased levels of physical activity have been linked to a reduced risk of subsequent dementia. Data from the Canadian Study of Health and Aging have associated regular physical activity (defined by a simple “yes/no” question) with a reduced risk of Alzheimer disease (relative risk 0.69, 95% CI 0.50– 0.96).10 In another analysis of the data from this study, the level of physical activity was assessed by combining 2 questions regarding frequency and intensity of exercise for participants who reported regular physical activity. A high level of exercise was defined as 3 or more times weekly at an intensity greater than walking. When compared with those who reported no regular exercise, those reporting a high level of exercise had a decreased risk of Alzheimer disease developing in 5 years (odds ratio 0.50, 95% CI 0.28– 0.90).8 In the Cardiovascular Health Study, conducted in the United States, participants who expended the highest quartile of energy (calculated at more than 1657 kcal/wk) had a lower risk of all-cause dementia (adjusted relative risk 0.58, 95% CI 0.41– 0.83) and of Alzheimer disease (adjusted relative risk 0.55, 95% CI 0.34– 0.88) compared with participants who expended the lowest quartile of energy (estimated at less than 248 kcal/wk).9 In Mr. A's case, even in the absence of evidence from randomized controlled trials on this topic, it is reasonable to recommend regular physical activity given his stated risk factors. Intellectually challenging activity of various types has been associated with a reduced risk of dementia in longitudinal studies. Daily mental activities were associated with a decreased risk of all-cause dementia (relative risk 0.59) in the Kungsholmen study.42 Similarly, the Washington Heights Study (New York) showed a reduced risk of all-cause dementia (relative risk 0.62) among participants who engaged in a higher level of leisure activity (self-reported participation in > 6 of 13 activities v. < 6 activities [low level] in the previous month).43 There is emerging evidence that cognitive training, especially involving novel or unfamiliar tasks, may delay cognitive decline. A recently published follow-up study of a randomized controlled trial of cognitive training appeared to show sustained improvement in specific cognitive performance up to 5 years after the intervention.44 Whether this type of endeavour translates into a reduced risk of dementia remains to be proven. Epidemiologic evidence has established that moderate consumption of wine (250–500 mL/d), compared with an intake of more or less than this amount, is associated with a reduced risk of subsequent all-cause dementia (relative risk 0.56, 95% CI 0.36–0.92) and of Alzheimer disease (relative risk 0.53, 95% CI 0.30–0.95).7 Advice about alcohol consumption should be tempered by the known risks of excessive use in terms of neurologic and other organ damage, as well as increased risk of injury from intoxication. In the absence of evidence from randomized controlled trials, a firm recommendation for the use of alcohol to reduce the risk of Alzheimer disease cannot be offered, neither can we recommend that a nondrinker begin to drink alcohol. There has been controversy in the literature concerning the contribution of head injury to subsequent development of dementia. Long-term follow-up of a cohort of World War II US Navy and Marine servicemen who were admitted to hospital during military service has shed light on this issue. Those who were admitted with moderate or severe head injury with loss of consciousness experienced an increased risk of subsequent Alzheimer disease (hazard ratio 2.32, 95% CI 1.04– 5.17, for moderate head injury and 4.51, 95% CI 1.77– 11.47, for severe head injury) compared with those admitted because of other causes.13 It is therefore appropriate to encourage Mr. A to wear appropriate head protection should he engage in contact sports or in activities that could result in head injuries such as bicycling. Epidemiologic studies have suggested that the consumption of several medications is associated with a reduced risk of dementia. These products include nonsteroidal anti-inflammatory drugs,17 vitamin supplements,48 and estrogens in women.49 In the case of nonsteroidal anti-inflammatory drugs, the most recent meta-analysis, of 25 observational studies, concluded that the risk of all-cause dementia was significantly lower among study participants exposed to these drugs than among those who had not taken them.18 However, a recently published randomized controlled trial of celecoxib (200 mg twice daily), naproxen (220 mg twice daily) and placebo in cognitively healthy participants was ended early because of concerns about drug safety and lack of effect, since no delay or reduction in the onset of dementia was observed.50 Thus, there is no justification for recommending the use of nonsteroidal anti-inflammatory drugs for the primary prevention of Alzheimer disease. Recent systematic reviews have also concluded that, in the absence of evidence from randomized controlled trials, there is no justification for consuming antioxidant vitamins C and E with the intention of reducing the risk of subsequent Alzheimer disease.51 Furthermore, doses of vitamin E greater than 400 IU/d have been shown to have negative cardiovascular effects.52 Studies of B vitamins are inconclusive and are considered in a later article in this series. This review highlights significant gaps in our current knowledge of risk factors for Alzheimer disease. Although we now know much about individual risk factors for dementia, we do not know how they interact or which risk factors account for what proportion of dementia cases. Also lacking is a clear picture of which specific interventions can lower this risk, and at what age and in whom they need to be implemented. Large (and expensive) longitudinal intervention studies are needed to define the optimal preventive strategies. For primary prevention, treatment of hypertension offers the best chance of reducing or delaying the onset of dementia. It seems likely that lifestyle interventions (regular exercise, both physical and mental, moderate alcohol intake, and avoidance of tobacco and head injuries) may also reduce the risk of dementia. Because of the logistical challenges involved, it is unlikely that the present level of evidence, based on longitudinal cohort studies, will soon be superseded by randomized controlled trials to test these interventions. Given the very large numbers of healthy people who would need to participate in dementia prevention trials, attention has been increasingly focused on those at highest risk, especially those with mild cognitive impairment. Thus far, no pharmaceutical agents have been shown to delay or prevent conversion to dementia, although mentally stimulating activities are showing promise. 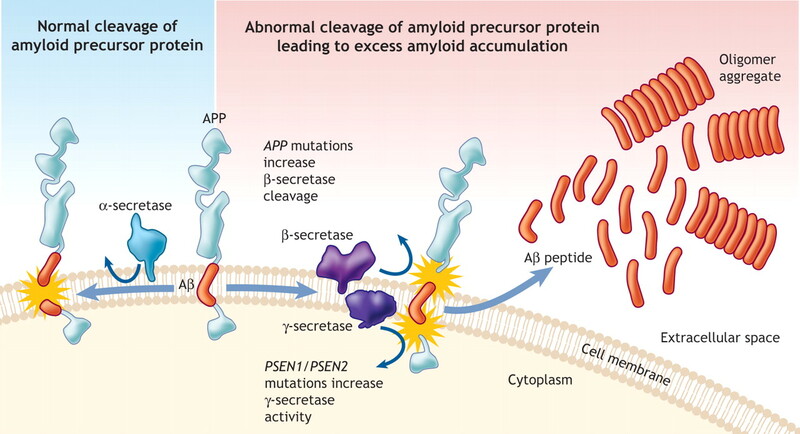 Agents that interfere with the production of insoluble amyloid fragments in the brain, or accelerate their clearance, are being actively pursued. Despite previous disappointments, it is possible that a vaccine may eventually be found. With regard to genetic risk factors, new susceptibility genes for late-onset Alzheimer's disease continue to be found with increasing regularity. Based on an empirical estimation from epidemiologic data, Mr. A's family physician can inform him that his risk of Alzheimer disease by the age of 80 is increased from 5% (baseline risk) to 13%, because he has a first-degree relative with late-onset Alzheimer disease.47 Because nothing in Mr. A's family history suggests autosomal dominant multigenerational transmission, he does not require genetic testing. Mr. A should be advised to control his cardiovascular risk factors, including his hypertension and cholesterol levels, using evidence-based strategies.54,55 However, Mr. A cannot be assured that these interventions will decrease his risk of Alzheimer disease despite other proven health benefits. Other than those outlined in this article, there are no high-quality clinical trials that have evaluated the effectiveness of modifying risk factors, and there are no proven therapies that will prevent dementia. •	Chertkow H. Diagnosis and treatment of dementia: Introduction. Introducing a series based on the Third Canadian Consensus Conference on the Diagnosis and Treatment of Dementia. CMAJ 2008;178:316-21. This series is based on recommendations from the Third Canadian Consensus Conference on the Diagnosis and Treatment of Dementia. Series editor: Howard Chertkow MD, Department of Neurology, McGill University and the Bloomfield Centre for Research in Aging, Lady Davis Institute, Sir Mortimer B. Davis–Jewish General Hospital, Montréal, Que. Editor's Note: The background papers with supporting evidence for the recommendations from the Third Canadian Consensus Conference on the Diagnosis and Treatment of Dementia were published in the October 2007 issue of Alzheimer's and Dementia and are available at www.alzheimersanddementia.org. These articles are also freely available at www.cccdtd.ca (through agreement with Elsevier). Contributors: All of the authors contributed to the study conception and design, revised the manuscript critically for important intellectual content and approved the final version submitted for publication. Acknowledgements: Christopher Patterson received support from the Institute of Advanced Studies, University of Bologna (Italy), during the preparation of this work. Chris MacKnight is supported by a New Investigator Award from the Canadian Institutes of Health Research. Chertkow H. Diagnosis and treatment of dementia: Introduction. Introducing a series based on the Third Canadian Consensus Conference on the Diagnosis and Treatment of Dementia. CMAJ 2008;178:316-21. Patterson C, Feightner J, Garcia A, et al. 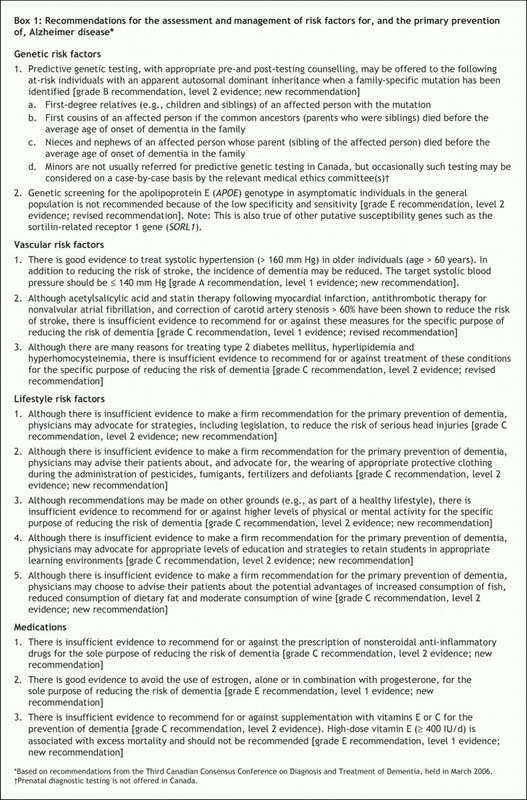 General risk factors for dementia: a systematic evidence review. Alzheimers Dement 2007;3:341-7. Hsiung GYR, Sadovnick AD. Genetics and dementia: risk factors, diagnosis and management. Alzheimers Dement 2007;3:418-27. Qiu C, von Strauss E, Fastbom J, et al. Low blood pressure and risk of dementia in the Kungsholmen Project. A 6-year follow-up study. Arch Neurol 2003;60:223-8. Kivipelto M, Helkala E-L, Laakso MP, et al. Midlife vascular risk factors and Alzheimer's disease in later life: longitudinal, population based study. BMJ 2001;322:1447-51. Notkola I-L, Sulkava R, Pekkanen J, et al. Serum total cholesterol, apolipoprotein E ε4 allele, and Alzheimer's disease. Neuroepidemiology 1998;17:14-20. Larrieu S, Letenneur L, Helmer C, et al. Nutritional factors and risk of incident dementia in the PAQUID longitudinal cohort. J Nutr Health Aging 2004;8:150-4. Laurin D, Verreault R, Lindsay J, et al. Physical activity and risk of cognitive impairment and dementia in elderly persons. Arch Neurol 2001;58:498-504. Podewils LJ, Guallar E, Kuller LH, et al. Physical activity, APOE genotype and dementia risk: findings from the Cardiovascular Health Cognition Study. Am J Epidemiol 2005;161:639-51. Lindsay J, Laurin D, Verreault R, et al. Risk factors for Alzheimer's disease: a prospective analysis from the Canadian Study of Health and Aging. Am J Epidemiol 2002;156:445-53. Launer LJ, Andersen K, Dewey ME, et al. ; EURODEM Incidence Research Group and Work Groups. Rates and risk factors for dementia and Alzheimer's disease. Results from EURODEM pooled analyses. Neurology 1999;52:78-84. Almeida OP, Hulse GK, Lawrence D, et al. Smoking as a risk factor for Alzheimer's disease: contrasting evidence from a systematic review of case–control and cohort studies. Addiction 2002;97:15-28. Plassman BL, Havlik RJ, Steffens DC, et al. Documented head injury in early adulthood and risk of Alzheimer's disease and other dementias. Neurology 2000;55:1158-66. Kukull WA, Higdon R, Bowen JD, et al. Dementia and Alzheimer disease incidence: a prospective cohort study. Arch Neurol 2002;59:1737-46. Li G, Higdon R, Kukull WA, et al. Statin therapy and risk of dementia in the elderly. A community-based prospective cohort study. Neurology 2004;63:1624-8. Zandi PP, Sparks DL, Khachaturian AS, et al; Cache County Study investigators. Do statins reduce risk of incident dementia and Alzheimer disease? The Cache County Study. Arch Gen Psychiatry 2005;62:217-24. Zandi PP, Anthony JC, Hayden KM, et al; Cache County Memory Study Investigators. Reduced incidence of AD with NSAID but not H2 receptor antagonists. The Cache County Study. Neurology 2002;59:880-6. De Craen AJM, Gussekloo J, Vrijsen B, et al. Meta-analysis of nonsteroidal anti-inflammatory drug use and risk of dementia. Am J Epidemiol 2005;161:114-20. Campion D, Dumanchin C, Hannequin D, et al. Early-onset autosomal dominant Alzheimer disease: prevalence, genetic heterogeneity, and mutation spectrum. Am J Hum Genet 1999;65:664-70. Sleegers K, Roks G, Theuns J, et al. Familial clustering and genetic risk for dementia in a genetically isolated Dutch population. Brain 2004;127:1641-9. Schoenberg BS, Anderson DW, Haerer AF. Severe dementia. Prevalence and clinical features in a biracial US population. Arch Neurol 1985;42:740-3. Haass C, Selkoe DJ. Soluble protein oligomers in neurodegeneration: lessons from the Alzheimer's amyloid beta-peptide. Nat Rev Mol Cell Biol 2007;8:101-12. GeneTests website. Available: www.genetests.org (accessed 2008 Jan 4). Blennow K, de Leon MJ, Zetterberg H. Alzheimer's disease. Lancet 2006;368:387-403. Rogaeva E, Meng Y, Lee JH, et al. The neuronal sortilin-related receptor SORL 1 is genetically associated with Alzheimer disease. Nat Genet 2007;39:168-77. Lee JH, Cheng R, Schupf N, et al. The association between genetic variants in SORL1 and Alzheimer disease in an urban, multiethnic, community-based cohort. Arch Neurol 2007;64:501-6. Larner AJ, Doran M. Clinical phenotypic heterogeneity of Alzheimer's disease associated with mutations of the presenilin-1 gene. J Neurol 2006;253:139-58. Cruts M, Van Broeckhoven C. Presenilin mutations in Alzheimer's disease. Hum Mutat 1998;11:183-90. Sherrington R, Froelich S, Sorbi S, et al. Alzheimer's disease associated with mutations in presenilin 2 is rare and variably penetrant. Hum Mol Genet 1996;5:985-8. Finckh U, Kuschel C, Anagnostouli M, et al. Novel mutations and repeated findings of mutations in familial Alzheimer disease. Neurogenetics 2005;6:85-9. Pericak-Vance MA, Grubber J, Bailey LR, et al. Identification of novel genes in late-onset Alzheimer's disease. Exp Gerontol 2000;35:1343-52. Myers A, Wavrant De-Vrieze F, Holmans P, et al. Full genome screen for Alzheimer disease: stage II analysis. Am J Med Genet 2002;114:235-44. Blacker D, Bertram L, Saunders AJ, et al. Results of a high-resolution genome screen of 437 Alzheimer's disease families. Hum Mol Genet 2003;12:23-32. Forette F, Seux ML, Staessen JA, et al. Prevention of dementia in randomized double-blind placebo-controlled Systolic Hypertension in Europe (Syst-Eur) trial. Lancet1998;352:1347-51. Folstein MF, Folstein SE, McHugh PR. Mini-Mental State.” A practical method for grading the cognitive state of patients for the clinician. J Psychiatr Res 1975;12:189-98. Feigin V, Ratnasabapathy Y, Anderson C. Does blood pressure lowering treatment prevent dementia or cognitive decline in patients with cardiovascular and cerebrovascular disease? J Neurol Sci 2005;229-230:151-5. Shepherd J, Blauw GJ, Murphy MB, et al. Pravastatin in elderly individuals at risk of vascular disease (PROSPER): a randomized controlled trial. Lancet 2002;360:1623-30. Heart Protection Study Collaborative Group. MRC/BHF Heart Protection Study of cholesterol lowering with simvastatin in 20536 high-risk individuals: a randomized placebo-controlled trial. Lancet 2002;360:7-22. Scott HD, Laake K. Statins for the prevention of Alzheimer's disease [review]. Cochrane Database Syst Rev 2001;(4):CD003160. Kalmijn S, Launer LJ, Ott A, et al. Dietary fat intake and the risk of incident dementia in the Rotterdam Study. Ann Neurol 1997;42:776-82. Scarmeas N, Stern Y. Mayeux R, et al. Mediterranean diet, Alzheimer disease, and vascular mediation. Arch Neurol 2006;63:1709-17. Wang H-X, Karp A, Winblad B, et al. Late-life engagement in social and leisure activities is associated with a decreased risk of dementia: a longitudinal study from the Kungsholmen Project. Am J Epidemiol 2002;155:1081-7. Scarmeas N, Levy G, Tang M-X, et al. Influence of leisure activity on the incidence of Alzheimer's disease. Neurology 2001;57:2236-42. Willis SL, Tennstedt SL, Marsiske M, et al. Long-term effects of cognitive training on everyday functional outcomes in older adults. JAMA 2006;296:2805-14. Tyas SL, Manfreda J, Strain LA, et al. Risk factors for Alzheimer's disease: a population-based, longitudinal study in Manitoba, Canada. Int J Epidemiol 2001;30: 590-7. Kivipelto M, Ngandu T, Laatikainen T, et al. Risk score for the prediction of dementia risk in 20 years among middle aged people: a longitudinal, population-based study. Lancet Neurol 2006;5:735-41. Cupples LA, Farrer LA, Sadovnick AD, et al. Estimating risk curves for first-degree relatives of patients with Alzheimer's disease: The REVEAL study. Genet Med 2004;6:192-6. Luchsinger JA, Mayeux R. Dietary factors and Alzheimer's disease. Lancet Neurol 2004;3:579-87. LeBlanc ES, Janowsky J, Chan BKS, et al. Hormone replacement therapy and cognition. Systematic review and meta-analysis. JAMA 2001;285:1489-99. ADAPT Research Group. Naproxen and celecoxib do not prevent AD in early results from a randomized controlled trial. Neurology 2007;68:1800-8. Boothby LA, Doering PL. Vitamin C and vitamin E for Alzheimer's disease. Ann Pharmacother 2005;39:2073-80. Miller ER III, Pastor-Barriuso R, Dalal D, et al. Meta-analysis: high dosage vitamin E supplementation may increase all-cause mortality. Ann Intern Med 2005;142:37-46. Shumaker SA, Legault C, Kuller L, et al. Conjugated equine estrogens and incidence of probable dementia and mild cognitive impairment in postmenopausal women: Women's Health Initiative Memory Study. JAMA 2004;291:2947-58. Canadian Hypertension Education Program. Management and prevention of hypertension in Canada. 2007. Available: www.hypertension.ca/chep/ (accessed 2008 Jan 4). Genest J, Frohlich J, Fodor G. et al, for the Working Group on Hypercholesterolemia and other Dyslipidemias. Recommendations for the management of dyslipidemia and the prevention of cardiovascular disease: summary of the 2003 update. CMAJ 2003;169:921-4.